Eagles offensive tackle Jason Peters, here watching Giants linebacker Olivier Vernon, suffered a bicep injury. The main focus of Doug Pederson's day-after news conference Friday was injuries, as is often the case when a team plays twice in a five-day span. 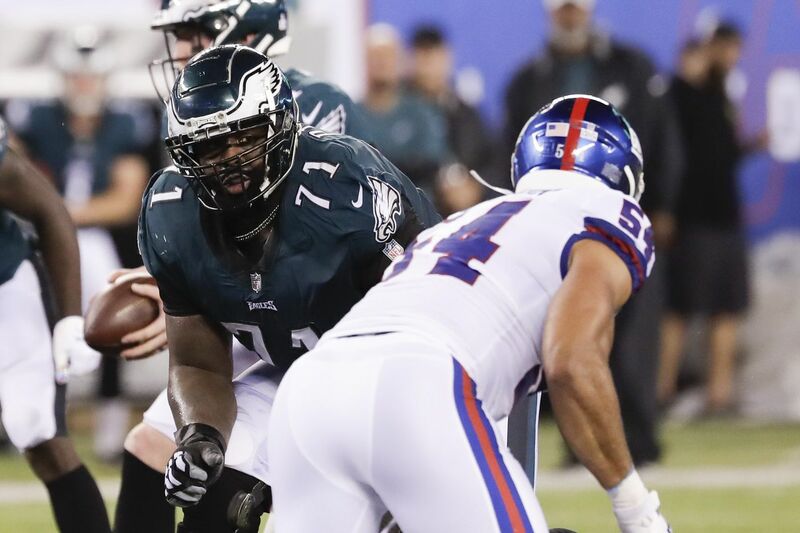 The Eagles coach said tests are still pending on left tackle Jason Peters' injured bicep, but early indications are "positive." Most likely, whether Peters can play with a bicep tendon tear depends on whether the tear is up near his shoulder or lower, closer to his elbow. The lower the tear, the less function a player will have without surgery. Peters, already battling a quadriceps strain, left Thursday night's 34-13 victory over the host New York Giants early in the third quarter with the bicep injury. He was replaced by Halapoulivaati Vaitai. Later, when right tackle Lane Johnson appeared to tweak his high ankle sprain, left guard Isaac Seumalo moved to right tackle and Stefen Wisniewski came in at left guard. Equally concerning might be the hamstring injury suffered by nickel corner Sidney Jones, which led Pederson to characterize Jones as "week to week." In Pederson-speak, that tends to mean "several weeks." The Eagles secondary is already missing starting safety Rodney McLeod, out for the season with a knee injury. Thursday night, McLeod's replacement, rookie Avonte Maddox, had to slide back into the nickel-corner role he was working in, behind Jones, before McLeod went down. The Eagles used corner Rasul Douglas as a safety, though Douglas had never played the position. He survived. Pederson indicated that with some time before the Oct. 21 game against Carolina, the coaching staff will figure out how to address the safety situation. Tre Sullivan and Deiondre' Hall are on the roster but have been used only on special teams. Pederson noted that the extra time offers an opportunity to "coach them up."